For those individuals who are morbidly obese, there are multiple types of bariatric procedures available for weight loss. One general type is known as restrictive bariatric surgery. This procedure reduces the size of your stomach but does not change your digestive process. Another category is called malabsorption or malabsorptive procedures. This type of weight loss surgery shrinks the stomach and also bypass the duodenum and sometimes the jejunum. The resulting “malabsorption” means fewer calories are taken in by your body. Fewer calories absorbed = greater weight loss. 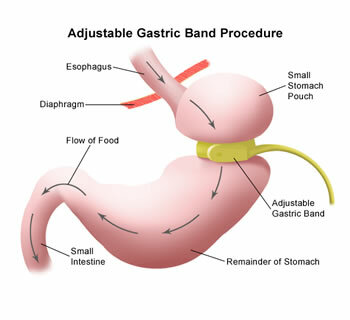 Restrictive bariatric surgeries include Adjustable Gastric Banding (AGB) and Vertical Banded Gastroplasty (VBG). These procedures do not alter your digestive system; however they do reduce the amount of food you can ingest. After the surgery, a person can only eat about one cup of food at a sitting. If you eat more than the recommended amount you will probably throw up and might also stretch your new stomach, causing the surgery to fail. 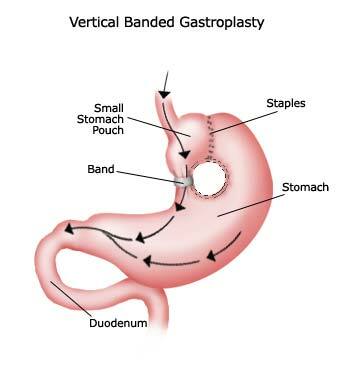 Vertical Banded Gastroplasty is also known as stomach staple surgery. Adjustable Gastric Banding is familiar to many as the Lap Band. 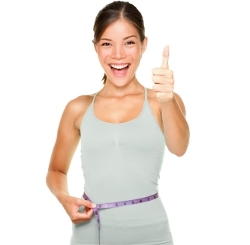 The advantages of the lap banding are fewer complications than other bariatric procedures. The drawbacks to this procedure are slower weight loss and also the fact that you cannot have other health complications present in order to be approved for lap-banding. But the process is less invasive than other surgeries, and the lap band can be removed later if the patient so chooses. Malabsorptive bariatric procedures work by reducing the size of the stomach and effectively bypassing the duodenum and sometimes also the jejunum. Malabsorption weight loss surgery includes Roux-en-Y, commonly called gastric bypass surgery, the Duodenal Switch, the Fobi Pouch, and Biliopancreatic Diversion. In the Duodenal Switch procedure, the surgeon blocks off part of the stomach, making it smaller. This reduces the amount of food that can be ingested and also limits calorie absorption. However, within a few months, a patient can resume eating the same food as they did before (with certain limitations, of course). The latest bariatric procedures are focused on minimally-invasive techniques. Laparoscopic bariatric surgery was the first of these newer techniques, and the past couple of years have seen the introduction of an improved technique in which endoscopic surgical instruments are inserted through the patient’s mouth. 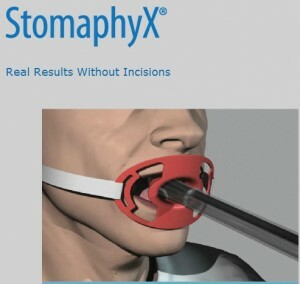 Known as StomaphyX™, a hose-like surgical device is inserted through the mouth, allowing the bariatric surgeon to grasp the stomach tissue and employ suture anchors. The physician creates several tissue folds in the stomach wall, thereby reducing its capacity to hold food. In most cases, the StomaphyX procedure can be performed as outpatient surgery. Surgery for weight loss is a significant even that will change your life. If you are considering bariatic surgery, you need to fully understand what the operation involves. Prior to having a procedure done, patients should carefully consider the following benefits and risks. As with any major surgery, bariatric procedures carry potential risks like bleeding and infection in the incision, bowel blockage caused by scar tissue, hernia through the incision and adverse reactions to anesthesia. In the case of the Roux-en-Y procedure, the most serious potential risk is fluid leaking from the stomach or intestines, which can result in abdominal infection and the need for follow-up surgery. There is also a slight possibility of injury to the spleen, leading to its removal if bleeding cannot be controlled. Some additional risks for Roux-en-Y are directly related to being obese, and include blood clots in the legs or lungs, cardiac problems and pneumonia. In restrictive/malabsorptive operations, such as the Roux-en-Y and Duodenal Switch with Biliopancreatic Diversion, there is an increased risk for nutritional deficiencies. This occurs because food bypasses the duodenum and jejunum where calcium, iron and other important vitamins and minerals are primarily absorbed. Certain women may develop anemia because insufficient vitamin B12 and iron are absorbed. Furthermore, decreased absorption of calcium can lead to osteoporosis. It will be necessary for the patient to take vitamins and supplements post-op to prevent these nutritional deficiencies. For individuals who have Duodenal Switch with Biliopancreatic Diversion surgery, they will also have to take Vitamins A, D, E and K. Before your weight loss surgery, the doctor will also ask you to lose weight through a medically-supervised diet plan like Optifast. Another risk of gastric bypass surgery is formation of ulcers in the stomach or small intestine. There is also the phenomenon called “dumping syndrome,” which manifests itself in diarrhea, cramps, sweating, palpitations and vertigo as a result of eating foods high in sugar content. A small percentage of individuals who have bariatric weight loss surgery end up developing gallstones. As a matter of fact, during rapid weight loss, the risk of developing gallstones increases. This can usually prevented by taking a medication which serves as a supplemental source of bile in the initial months after surgery. Restrictive-only operations, such as the laparoscopic adjustable band, can lead to vomiting. This is caused when the new, smaller stomach is “overstretched” by food that has not been chewed thoroughly. Although restrictive operations result in weight loss in the vast majority of patients, they are less successful than combined restrictive/malabsorptive operations in achieving significant and lasting weight loss. Medicare currently reimburses for bariatric procedures on a regional basis and is the primary payer for approximately 20% of all procedures performed. There are procedure reimbursement codes for bariatric surgery with prior authorization. Insurance companies involved in weight loss surgery include Aetna, Blue Cross, Blue Shield, Cigna, First Health, Humana, Principal Financial Group and United Health Care. Bariatic coverage depends on factors like BMI, related co-morbidities and participation in supervised nutrition programs. However, some weight loss surgeries are considered cosmetic and likely won’t be covered by your insurance. Be sure to research and thoroughly understand the insurance issues involved before going ahead with any type of bariatric surgery for weight loss. Avoid vending machine snacks at work. Bring healthy snacks from home and keep them near your desk!